I'm looking for a freely accessible website that provides access to recent high-resolution (<~1–5 km) satellite-based snowcover estimates (snow / no-snow). Many meteorology websites provide an interface to cloud cover satellite imagery, but it's not always easy to see snow-cover from those. The MODIS satellite provides visible imagery down to a 250-metre resolution. This can (in absence of clouds) certainly be used for the above-stated purpose, and indeed they produce a daily global snow-product at a roughy 5 km grid. Although accessible in principle in HDF-5 format, it's quite a bit of work to download and read this data to see the extent of snowcover 50 km from home. The Senorge website provides a fantastic interface, exactly what I'm looking for, but only for Norway. Many meteorological websites, e.g. SMHI in Sweden, provide regular snow-thickness maps, but those are heavily interpolated and irregularly updated. Does anyone know a website that lets the user look at recent satellite-based snow products on an easily zoomable map? I'm most interested in Sweden at the moment, but it would be quite interesting if it was global (like the MODIS product). MODIS data is accessible as JPEG images. Sometimes it's still not easy to find an exact point on the image, but at least you don't have to bother with HDF. If you can't find today's images for a specific region, you can look back in time. We use this service to check ice coverage on big lakes when planning ski trips. 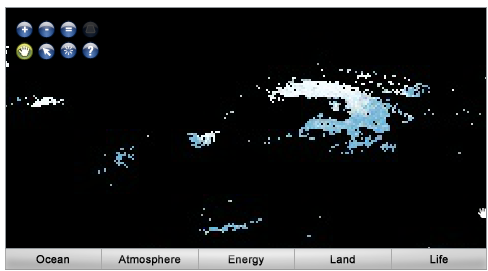 This NASA web-interface provides a somewhat recent (several days old) interface to global daily snow-maps. From the main page, click on Land (immediately below the map), then click on Snow cover in the drop-down menu that appears. Then, on the right, under "Matching datasets", select "Snow cover - 1 day (Terra / Modis)" and click "Select". This will show a 3-day old global snow-cover map that is zoomable. This is the best I have been able to find so far. It doesn't show the coastlines, but in this example we can see the Alps, the southern Norwegian highland and a wide arch in Lapland and Finland. The resolution is not optimal and it's hard to see what is where. Not the answer you're looking for? Browse other questions tagged preparation snow or ask your own question.